Sixteen thousand pages?! How is that even possible? What is sixteen thousand pages even supposed to be? But looking at all those books, I had to agree that they probably could be 16,000 pages put together. There were a lot of thick books there. 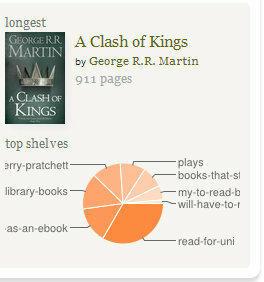 According to the little pie-chart thing that Goodreads so kindly provided, most of those books were stuff I read for class. Yeah, I didn’t cut the names off like that, it was that way when I got there. That, at least, wasn’t surprising. I guess I shouldn’t have been that surprised either that there were so many more books than any other year that I’ve been recording these things. Last year’s course was way different and more intense. Where we would spend about a week on a Shakespeare play before, now it was only one class. For another single period we had to read the entire Twilight Saga. I referred to that as my “2000 pages of torture”. I’m still looking for some of the brain cells that ran away during that time. It’s so weird to see all those moments resurface in reading statistics. But still, the biggest question remained: how much is 16,000 pages really? Together, all those books form a pile that is nearly a metre high. Against me this is almost 2/3 of my own height. It is high enough that I got bored drawing that stack of books. How much do we really read in our lives? 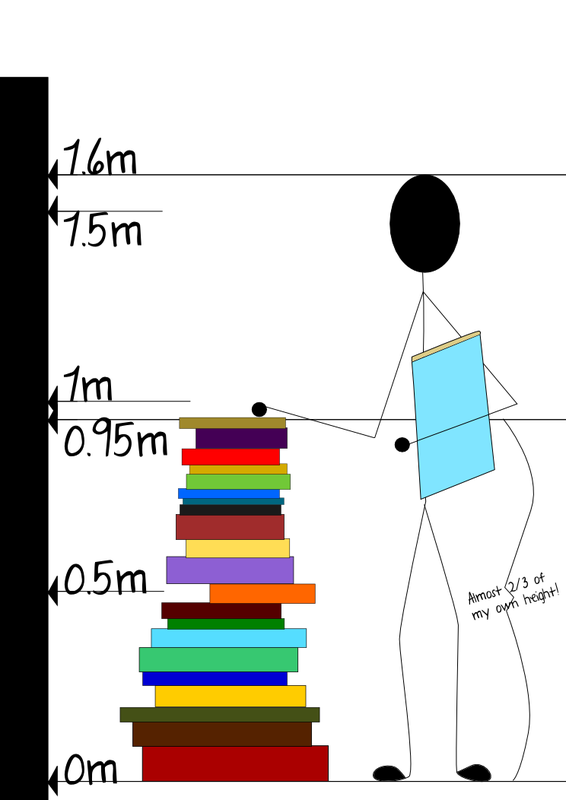 We think of books as things that fill bookshelves, but how much space do they really fill in our brains? How much of our lives are really taken up by the things that we read? I’m going to go read now and ponder this some more. Tomorrow I finally get to go see Frozen, which I’m very excited about. PS. Do you still have a little room in your life for a 3D desktop calendar? 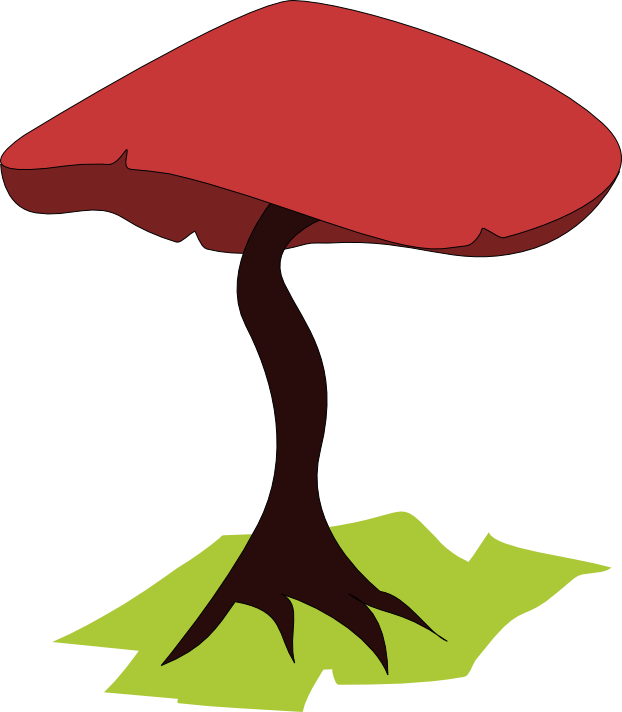 This entry was posted on January 26, 2014 by Elana. 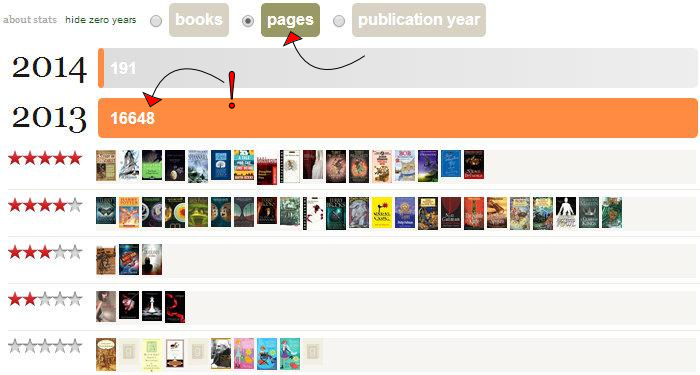 It was filed under Books and reading, Origami tutorials and was tagged with books, Goodreads, literature, reading, reading habits, reading statistics, statistics, university. Mine’s 4.22. But I’m generous, most of the time. I think I’ve only once given a book one star. Actually, it’s the other way round. Yes, I have to read most of the stuff I do read, but actually that makes my ratings higher. My literary training has made me appreciate all kinds of different genres and helped me to better understand them. Even if I find a book boring or too long-winded, what we discuss in class helps me see the other side of the book as well, which makes my ratings higher. I didn’t even give the Twilight Saga one star, much as I hated reading it, because I did like one or two chapters out of each book. It has a few good points, just massively overshadowed by bad writing. That pile of books reminds me of when I was a ridiculously ambitious middle school kid and would borrow from the library far more books than I was capable of reading in time. (I’ve never been a particularly speedy reader.) My book pile looked just like that! Oh, that must’ve been a pain! But in my case it was an electronic system, so it was no big deal for the librarians to check them all back in.